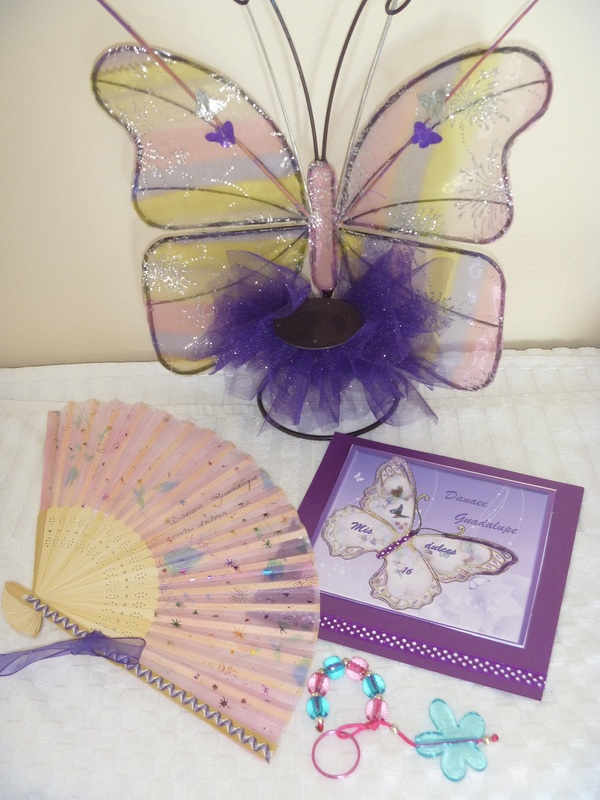 If you are ever invited to a Quinceañera celebration – go! Last Saturday Lawrie and I, plus my sister Joann attended this very special event, at the invitation of our friends Freddy and Yadira Medina. 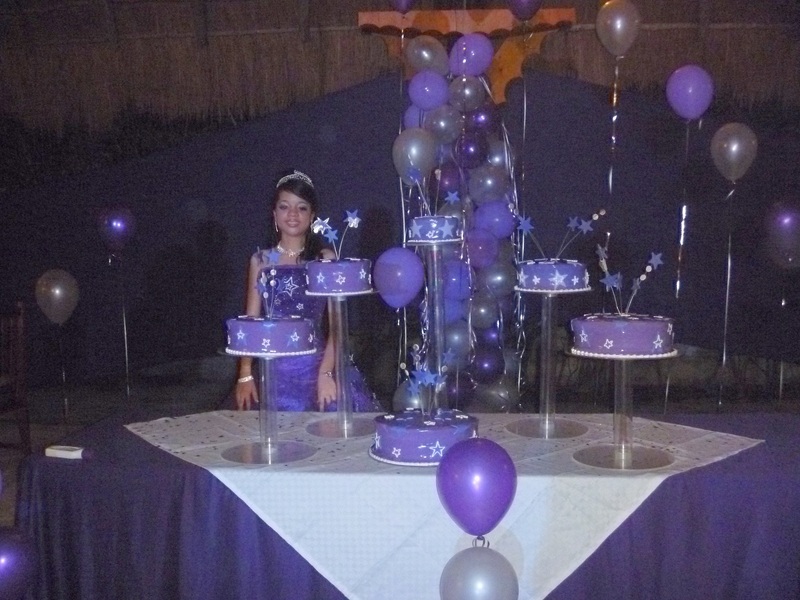 It was the Quinceañera or celebration of the fifteenth birthday for their daughter Danaee Guadalupe. This is primarily a Latin American celebration – very different from any other birthday, as it marks the transition from childhood to young womanhood. The celebration, however, varies across countries such as Cuba, Dominican Republic, Argentina, Paraguay, Uruguay, Ecuador, Columbia, Venezuela and Mexico. 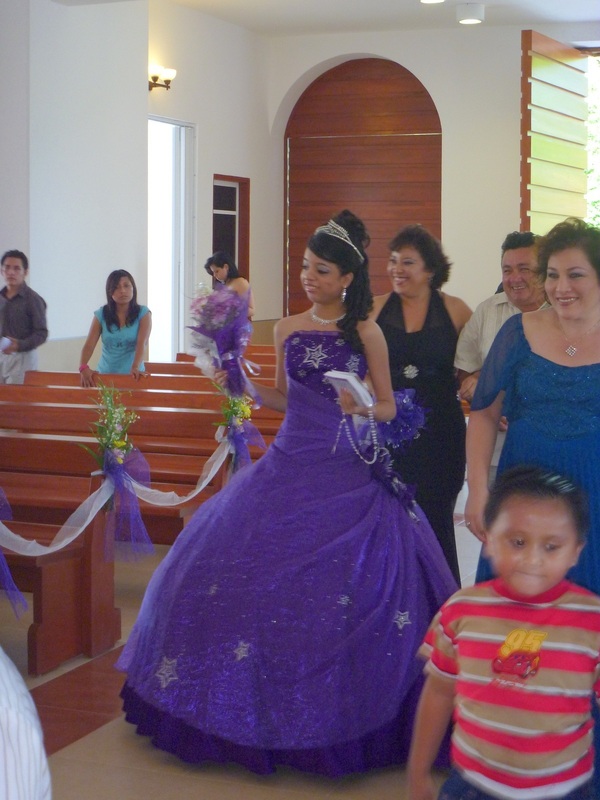 There are generally several parts in the Quinceañera celebration following the thanksgiving mass. Parts of the celebration are usually previously practiced, oftentimes for weeks in advance, sometimes even months. 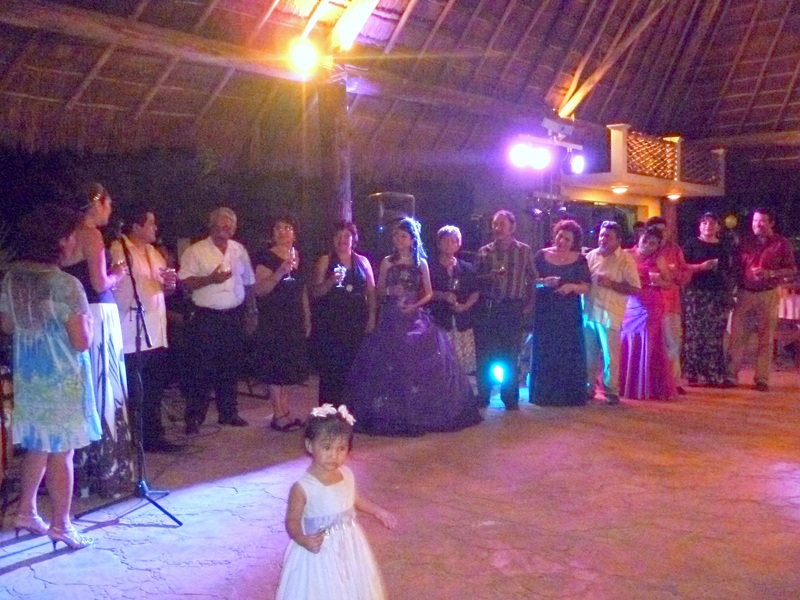 ﻿﻿﻿﻿﻿Later, around nine in the evening, Lupita’s family and friends gathered for the celebration party at the Playa de Mexico beach club on Sac Bajo. Freddy and Yadira (her parents) plus brother Diego and other family members spent many hot sweaty hours decorating the huge palapa, setting up the bar, organizing tables and chairs for hundreds of guests, and lighting dozens of candles along the pathways. It looked fabulous. Freddy’s former Soggy Peso co-workers pitched in to help out for the night. Kash was head waiter, and Freddy’s nephew Yo-Yo was the head bartender. And then the party got started! To begin the evening music ws provided – first by a disc jockey and then later by Javier and the Band With No Name – to keep guests entertained while they waited for the formal events to begin. Lupita was at the entrance greeting guests and handing out party favours with her mom, grandmother, and various aunties. Next was the toast to Lupita – given by Lupita’s very tall and very beautiful aunt, Freddy’s youngest sister. She incorporated a short speech and the touching of glasses before drinking a toast to Lupita. For me, the best part of the evening was the very emotional and symbolic ritual of the shoe, changing from the shoes of a little girl to the high heels of a young woman. Freddy got down on one knee to carefully remove the black and white sneakers and replace them with white satin high-heeled bootlets. He was so proud, so happy, and at the same time tearful to see his little girl growing up. 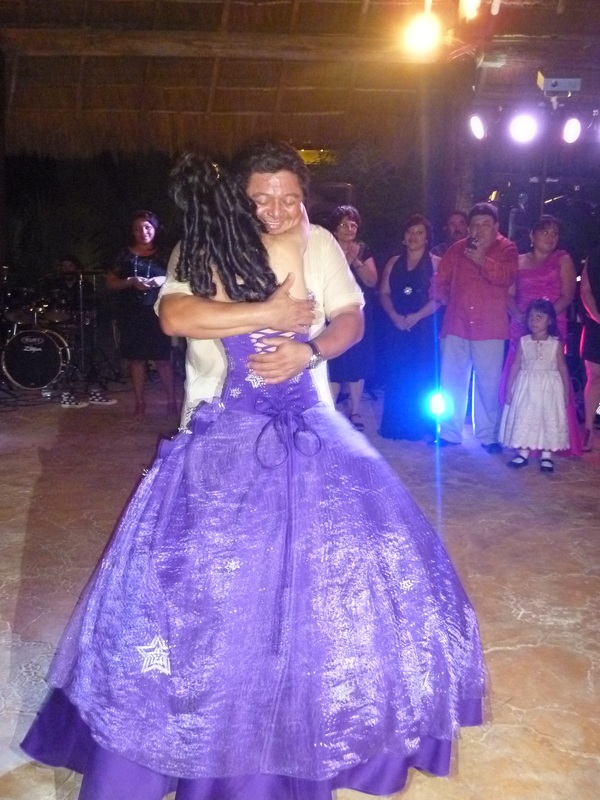 The first waltz started with her dad, and then her padrino, uncles, brother, and finally invited guests. As each man ‘cut-in’ to dance with Lupita he would bow, extending his right hand, and begin the dance. When the next man ‘cut-in’ the dancing partner would twirl Lupita gracefully handing her off to the new partner. For the final waltz she was handed back to her dad. The evening then segued into dancing, chatting, mingling, until midnight when the main course was served – a delicious roast pork dinner with all the trimmings. This lead to more dancing – but by now most of the gringo contingent had given up for the night. Lawrie and I were the last two stragglers to head home to our beds. The party was nowhere near over! There were three-year-olds still dancing as we slunk out the entrance around one in the morning. After we had left there was the cutting of the cake ritual. The beautifully decorated cakes looked so yummy, I was sorry we couldn’t stay awake to sample the goodies. This was followed by more dancing until the wee hours of the morning. In some Quinceañera celebrations the family and closest friends attend a special breakfast, known as the recalentado (re-warming), in which any food not consumed during the night before is warmed again and served with beer or soft drinks. Groan! How do they do it? We are such party wimps.